A well thought out mission statement can be a compass that provides a clearly defined direction for your company to get it to where it needs to go. If written well, your mission statement will communicate to your associates, clients, prospects, partners and other stakeholders what your organization is all about. 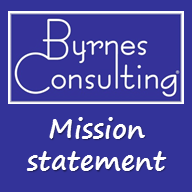 Work with Byrnes Consulting to learn more about writing a strong mission statement and its impact on your long-term business success.